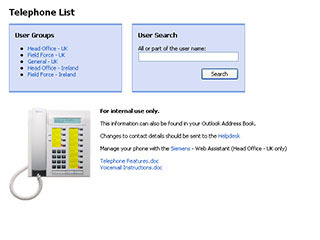 Today sees the launch of a new extranet based telephone list application containing contact information of head office and field force employees in the UK and Ireland. The application replaces the need for spreadsheets to be manually maintained, distributed and printed each month. The home screen provides options to allow users to find employee contact details via groups or name search. The application is accessible by head office and the field force, via the company VPN. Information is automatically updated every night into SQL Server from Active Directory, maintained by the systems administrator.